I am back after passing through weeks of submissions and just like I promised at the end of chapter 2, this time we are chasing a master thief. Lupin III (pronounced as Rupan Sansei) is a Seinen manga written and illustrated by Kazuhiko Kato under his pen name Monkey Punch. Let’s clear our background before we go on reviewing it. Seinen : Just like last time this is a genre. While shounen is targeted for younger male audiences; seinen is targeted for slightly older male audience, roughly put 18-30(as per wikipedia). It is similar to ‘boy to man’ analogy. So seinen is more manly in a sense the story and illustrations include mature content. This also means that graphic violence depicted is much more severe. Though now a days even shounens have crossed the boundaries and doesn’t really matter. Lupin/Rupan : Lupin the story’s titular character is claimed to be grandson of Arsene Lupin who appears in fictional novels of famous French writer Maurice Leblanc. Leblanc’s intellectual property rights lead to renaming Lupin to Rupan outside Japan (based on Japanese pronunciation of the word). So in case you watched the anime/movies based on the manga named as Rupan, believe me they are same. Lupin III : most wanted/Shin Rupan Sansei : The original manga was published and serialized in Weekly Manga Action in from 1967-72. It was followed by an extended manga named Shin Rupan Sansei (literally new Lupin III in Japanese) in 1977. There have been few more reruns of Lupin though except for this none of them were written by Monkey Punch. This review acknowledges Shin Rupan Sansei as part of original work. Arsene Lupin III is grandson of legendary thief Arsene Lupin (this explains the three in his name). Just like his grandfather Lupin is also a gentleman thief and is acknowledged as world’s number one thief by virtually every law agency on earth. Now rest of the story is about adventures of he and his colleagues. It includes a master marksman Daisuke Jigen, 13th descendant of a legendary samurai Goemon Ishikawa XIII and a femme fatale Fujiko Mine who is also love interest of Lupin. A thief requires a law-man to chase him. This role is fulfilled by Inspector Koichi Zenigata. Most of the initial adventures include Lupin’s trademark style of sending a notice to owner of the object he is going to steal and then how the gang goes on about robbing it and Zenigata’s attempts to prevent it. Slowly the subplots evolve. Like Fujiko’s trademark usage of Lupin to get things she wants for herself. Also Lupin going to save Fujiko after she steals something. Most notable example of this is Chapter 7 : The hand is quicker than spy (Japanese title translates to magician) where he tackles the magician Pycal. He also finds some recurring enemies in the series as he gets involved with larger crime syndicates – the notable ones are Pycal and Mister X who is leader of Scorpion Crime syndicate and also a very bitter enemy of Lupin. It also focuses on how Lupin’s relations with Zenigata develop. Before proceeding to other aspects, one must note that Lupin III is heavily influenced from the original French work. This is evident from Lupin’s personality. His gentleman approach is more French than British; the best feature being loving attractive women. His chivalrous streak of helping attractive women and wishing to date them coincides with portrayals of most of the french romantic characters. Also we should note that this work is based on Maurice Leblanc’s work. Leblanc was the contemporary of Sir Arthur Conan Doyle, writer of perhaps the best detective of all time – Sherlock Holmes. So Lupin is polar opposite of Holmes except for the inner sense of righteousness. I got to know about this manga when I watched him in the movie Lupin III vs Detective Conan. As detective conan being more famous manga I recommend you to start by watching this movie first. Also Kaitou Kid in conan is pretty similar to Lupin though he is not heavy womanizer like Lupin. The importance of Lupin III lies in the fact that it inspired many of the future mangas to take the detective/gentleman thief genre seriously and introduce the audience to a different type crime fiction who till then were more into stories by Edogawa Rampo which sometimes tended a bit more to occult fiction. To be precise it started an entire new genre Kaito, mangas and anime featuring a gentleman thief. The most lovable character in this series is without doubt – Fujiko Mine. Fujiko has everything that a femme fatale should have. She is beautiful, intelligent, expert with weapons and a real badass. I simply can’t blame Lupin for falling for her tricks like Jigen blames him in the story. Her illustration in the book is equally praiseworthy and you simply can’t ignore her. While obviously Lupin and his other collegues are depicted beautifully, the one that deserves mention is Zenigata. Zenigata is just the perfect foil to Lupin and I liked his character very much. 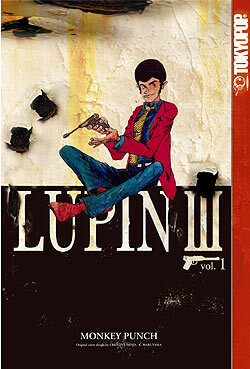 Though his illustration is not one of my favourites as he looks a crappy copy of Lupin. Daisuke Jigen serves the purpose of best friend perfectly and his skills justify him perfectly (0.3 second quickdraw, whoa!). The art is fantastic as well, especially small changes in Lupin’s face while depicting his emotions. (especially his lust towards Fujiko in intimate scenes). Also one should remember it is a 70-80s series. So art is not modern and many of us might not appreciate it fully. IMO the drawings are super and in no way less than modern digital animation. Lupin III is a fun, more mature manga. It has its moments but then it depends story wise. Some of the stories are amazing while some of them are not. My personal favourites are chapters – Mystery Woman, Hand is quicker than spy and all in which Mister X or Pycal appear. Though the best is a movie named The Castle of Cagliostro. As it paved way for a new genre itself, it earns extra points. I am rating it 73.5/100 -> making it a very good manga. But I also add a note that it is restricted to a specific audience. Many of us might not be able to digest Lupin’s ideals or the techniques he employs to steal. Still it is worth a read for generation like us who have barely read anything else other than shounens like Naruto, One piece or Dragon Ball. Next issue clue – well I this is trend these articles are gonna follow. I am gonna give clues for next manga. You can verify it when the next article is published. The clue this time is relatively simple. After 3 boys manga, it is time for girls. It is a seiun award winner manga, deals with Cards and was hugely famous during the early 2000s due to its anime. Enough hints according to me.